Another year, another championship, another victory for our ladies. 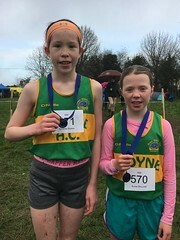 This was the story from Two-Mile-Borris following the running of the County Novice Cross Country Championships. With the majority of our athletes eligible to compete nine ladies and four men took to the field for the ladies 4k and men’s 6k races. Underfoot conditions were ideal, the weather was mild but a strong wind played it part throughout the races making our athletes dig deep at those stages of the race when the wind was in their faces but to their credit everyone performed very well and should be proud of their efforts on the day. The ladies were first away with Louise Fogarty hot on the heels of the leaders with Lorraine Healy just off that group and followed by Sarah Healy and Angela Fogarty with Kate Harrison, Aisling Maher, Sharon Kiely, Susan Fogarty and Ber Spillane all in a group just behind. Lorraine made a great effort to come alongside the leader and both ran together for much of the second lap. The break happened on the top part of the course with Lorraine pushing hard to stay in touch. This huge effort caught up with her in the final couple of hundred metres when she was passed by another athlete but credit to her in maintaining her form to cross the line in third place and yet another individual bronze to add to last year’s collection. Louise and Angela Fogarty were having the race of their lives moving steadily through the field to finish 5th and 6th respectively to clinch the team title for a second year running. Sarah Healy came through for 11th with Kate Harrison in 17th. Aisling Maher made up great ground in the final lap to finish 20th with both Sharon Kiely and Susan Fogarty just behind in 21st and 22nd respectively followed by Ber Spillane 25th. This was certainly a team effort from all nine athletes and congratulations to them on another great achievement. Our men were part of a very strong novice contingent in their race but again great credit is due to all four on their efforts. Stephen Flanagan led them home in an excellent 10th place followed by Jody Sweeney in 19th, Richard Daly in 23rd and Patrick Bowe in 35th. The boys finished 6th in the team event. Congratulations to all the athletes for their efforts today and no doubt as the season progresses that there can be even more reward for them.